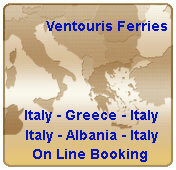 From Italy to Albania or v.v..
.Make your reservation Online or by Fax. All major credit cards accepted. 5, 25th August Str. 71202 Heraklion - Crete - Greece.